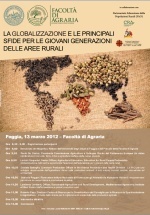 Education for Rural People: Seminar "Globalization and main challenges for young generations in rural areas"
FAO Officers attended the conference, which was held at the Aula Montel of the Faculty of Agriculture of Foggia. 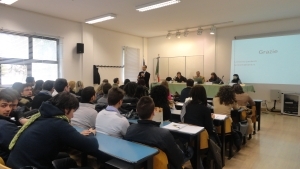 They addressed the issues of education and the importance of livestock production in rural areas of developing countries, Dr. Stefania Ruggieri, the National Research Institute for Food and Nutrition, spoke on the role of women to reduce malnutrition and promote health researcher. Dr. Lamberto Lamberti highlighted some innovative systems for the support of small rural producers and dr. Robert Pope presented the role of research for sustainable agriculture. 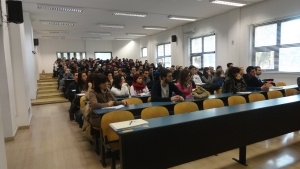 In a video conference from Brussels, Dr. Paolo De Castro, President of the Agriculture Commission of the European Union, addressed the theme of food and agriculture in the era of new scarcity. The event was combined with the collection of food and educational materials, organized in collaboration with Caritas, and particularly the exposure of wheat varieties resistant to adverse climatic conditions that will be provided by the Research Centre for Cereal Council Research and Testing in Agriculture. The issues addressed and the quality of the speakers have helped young people to reflect on the themes of globalization and development models that promote real progress in the poorest countries and a more balanced and equitable use of resources of the planet. The Dean of the Faculty Professor. Agostino Sevi introduced to the conference.